The Conservative Party has been accused of "ripping up" the Good Friday Agreement by seeking changes to the Brexit withdrawal deal. On Tuesday, MPs voted to back an amendment seeking "alternative arrangements" to replace the Irish border backstop. The SNP's Ian Blackford said the result showed MPs had "reneged" on the UK's commitment to the peace deal. But the DUP deputy leader, Nigel Dodds, described that as "outrageous". MPs, including the DUP, backed an amendment by Conservative MP Sir Graham Brady by 317 votes to 301. It is not binding but Prime Minister Theresa May has said the vote gives her a mandate to return to Brussels to seek changes to the legal text. The Good Friday Agreement is an internationally binding treaty that was signed in 1998 and helped end more than three decades of violence in Northern Ireland. The peace that followed allowed for the removal of security checkpoints at the border between Northern Ireland and the Republic of Ireland. Mr Blackford, who is the leader of the SNP at Westminster, said MPs who backed the Brady amendment had "reneged on the backstop" and the peace agreement. But Mr Dodds said Mr Blackford's words were "reckless", and that the DUP would now work with Mrs May to "deliver the right thing for the UK". "The house has expressed support for the sort of deal that will get through," he added. The backstop is the insurance policy to avoid a hard border between Northern Ireland and the Republic of Ireland unless and until another solution is found through a wider UK-EU trade deal. The UK government agreed to a backstop in the draft withdrawal deal with the EU in November 2018 that would take effect at the end of the transition period in December 2020. It would see the whole of the UK stay in a customs union with the EU, while for regulatory matters, Northern Ireland only would continue to follow some EU rules that would see extra checks on goods coming into NI from the rest of Great Britain. 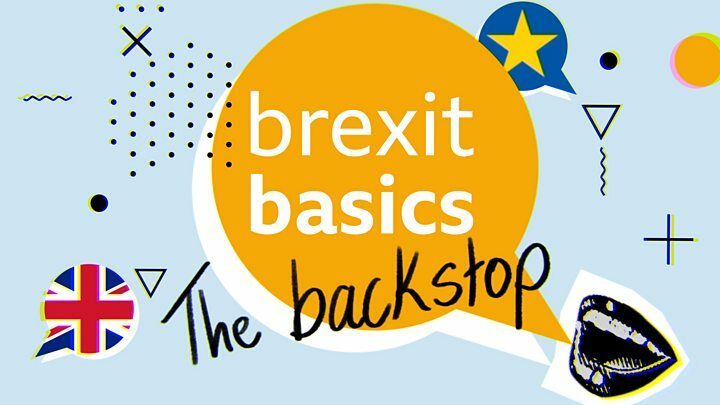 Why is there opposition to the backstop? Although it would avoid checks on the land border in Ireland, it has been rejected by the Democratic Unionist Party (DUP) and other parties at Westminster who said it created a "de facto Irish Sea border". The DUP was opposed because it believes anything that separates Northern Ireland from the rest of the UK could threaten the integrity of the union. 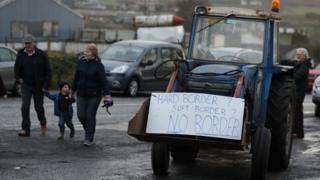 But a majority of political parties and business groups in Northern Ireland have urged support for it. Mrs May has said she recognises the concerns about the backstop, and is planning to seek changes to it - but the EU has already said it is not willing to renegotiate the current withdrawal agreement. What has the reaction to the votes been? In a statement issued after the votes, the Irish government said its position on the Brexit deal has not changed. Both it and the EU have repeatedly said since the draft deal was published in November, that it cannot be amended. Its statement said: "The withdrawal agreement is not open for re-negotiation. "We have consistently said that we want the closest possible future relationship between the EU and the UK. A change in the UK red lines could lead to a change in the political declaration on the framework for the future relationship, and a better overall outcome." The Irish government also said it will continue its preparations for a no-deal scenario. Earlier this month, it said it was implementing its plans for a no-deal Brexit and would be prioritising Brexit legislation through Dáil Éireann (Irish parliament) in the form of an "omnibus bill". How have other Northern Ireland parties reacted? Sinn Féin South Down MP Chris Hazzard, said the government was trying to "intimidate" the Irish people with a hard border. SDLP leader Colum Eastwood said: "London has decided that the interests of the people in Northern Ireland are secondary to the needs of the Conservative Party". "The rejection of the Irish Backstop, the only viable mechanism to prevent a hard border on the island of Ireland, is an affront on the Good Friday Agreement," he said. Alliance Brexit spokesperson Stephen Farry MLA said parliament has voted to send Brexit down "a dead-end" on the backstop. "Many people will be exasperated at a dysfunctional parliament unable to process and work through the real choices facing the UK around Brexit. Thirty-one months on from the referendum there is still no coherent way forward," he said. Green Party leader Claire Bailey said the "alternative arrangement" was a "non-runner". The independent unionist MP for North Down, Lady Hermon, voted against the amendment. Earlier she told the Commons it was unclear what the alternative arrangements proposed amounted to, and that she was "very sorry" that the prime minister had moved away from her original commitment to the backstop. On Tuesday evening, Taoiseach (Irish Prime Minister) Leo Varadkar said the Republic of Ireland has to hold its nerve as the Brexit deadlock between the UK and EU continues. He was giving a speech at an Irish Farmers' Association dinner. He spoke to Mrs May on Tuesday morning ahead of the votes in the Commons, and said he would speak to her again after the result. During his speech in Dublin, Mr Varadkar said: "Brexit is the great political challenge of our time, and we have to hold our nerve." "I think the words of the poet Maya Angelou apply perfectly to Brexit: While hoping for the best, we must be 'prepared for the worst and unsurprised by anything in between'." He also told the audience at the dinner that the Irish government has alerted the European Commission that it will seek emergency aid in the event of a no-deal Brexit. The purpose of it would be to help mitigate the impact on Irish trade, in particular for the beef, dairy and fishing sectors, he added. Brexit: What does Ireland do if there’s no deal?